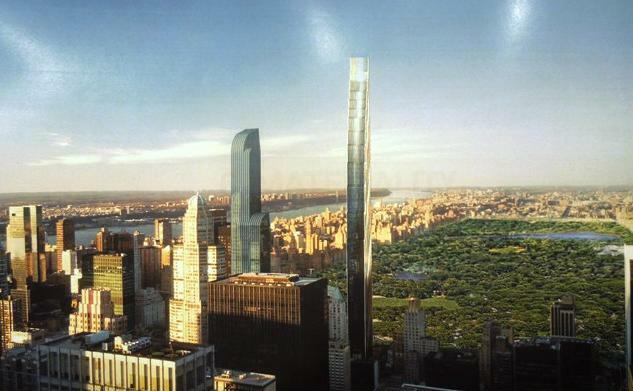 Rendering of proposed tower on 109 West 57th St, Manhattan. Image Credit: ShoP Architects, Courtesy of Historic Districts Council. Applicants stated that a tower could be built as of right without the need to seek Landmarks’ approval, but the proposed plan would be more respectful toward the individual landmark. On October 1, 2013, the Landmarks Preservation Commission held a hearing on the proposal for the new development of a through-block site at 109 West 57th Street. The proposed residential tower, with commercial use on the lower stories, would occupy a vacant lot, as well as a portion of the adjacent lot where the individually landmarked Steinway Hall is located. A portion of Steinway Hall’s first-floor interior was recently designated by Landmarks. Michael Stern, Managing Partner of JDS Development Group, testified that it would be possible to build a tower that is as tall at the street front as of right. Instead, they presented an application to Landmarks that would overlap with landmarked site, but minimize the development’s visual impact on Steinway Hall. Stern said the fundamental question before Landmarks was “which configuration is the better and more appropriate plan.” Stern noted that JDS had endorsed the interior landmark designation, and that the new development would entail the “meticulous restoration” of Steinway Hall. Higgins and Quaseberth consultant Bill Higgins said the developers intended to build a “dramatic vertical skyline building in direct juxtaposition with the landmark.” Higgins said the proposal was “keeping with the spirit of New York City” and the “vertical instinct” of Manhattan development. The application was presented by Christopher Sharples, Gregg Pasquarelli and Vishaan Chakrabarti of SHoP Architects, the design firm behind the Barclay Center and Pier 17. A glass atrium would face the streetwall, with a zoning setback requirement of 85 feet. The applicants said the sidewall of the Steinway building would be visible through transparent glass of the atrium, which would provide a handicapped-accessible entrance to the Landmarked interior. Steinway Hall’s sidewall would also be visible to pedestrians above the atrium. The set back tower would rise to a height of 1,350 ft., and the development would possess 300,000 sq. ft. of zoning footage. The walls on the interior courtyard of Steinway Hall would be demolished as part of the development. The development would include a permanent auditorium space, over which the Steinway company would retain control. Chakrabarti said they had looked at “skyscrapers that New Yorkers adore” when designing the tower, and determined that those skyscrapers shared the characteristics of slim silhouettes, spires, and fine cladding materials. The proposed tower would have a series of small setbacks that Chakrabarti referred to as “feathering.” Pasquareli said that the building’s materials were inspired by those of Steinway Hall, and would be comprised of bronze, glass, and terra cotta. He further added that “the notion of depth and texture was incredibly important,” and that the tower’s east and west facades would features 26 uniquely shaped twisting terra cotta columns with brass filigree, each with a maximum depth of eighteen inches. The tower would be faced with glass and bronze on the north and south and be topped with an all-glass spire. Lee Ping Kwan, testified in favor of the proposal, and suggested that the applicants work with glaze artists on the terra cotta columns. Landmarks Chair Robert B. Tierney stated that Manhattan Community Board 5 had also issued a resolution supporting the plan. Landmarks General Counsel Mark Silberman clarified that commissioners had the authority to review the proposal in its entirety, not just its impact on Steinway Hall. Commissioner Fred Bland found the proposal generally approvable, calling it “far superior” than the tower that could be built without Landmarks’ oversight. Bland stated that the tower would make “a huge contribution” to the collection of skyscrapers in the City. Commissioner Michael Goldblum concurred, determining that Steinway Hall was ultimately better served by this plan than what could otherwise be built, and that the architecture was “really lovely.” Goldblum advised that the new building could be revised to better recognize and interact with Steinway Hall. Joan Gerner praised the proposal as “incredibly creative,” and commended its modern interpretation of historic facade materials. Commissioner Margery Perlmutter found the tower inconsistent with Landmarks’ prior actions that allowed the removal of walls from an individual City landmark. Perlmutter said that there were more appropriate sites in the City to develop a residential tower. Without a quorum for a vote, Chair Tierney said that he agreed the proposal represented a direction of “letting this landmark breathe, and letting it be restored,” as well as “high quality, inventive, creative architecture.” He asked the applicants to return to Landmarks at a later date for further discussion and a possible vote. Chair Tierney said the “totally appropriate” project represented the way in which Landmarks could facilitate “significant architecture” in the City while allowing “important growth.” The Commissioners unanimously voted to approve the project. LPC: 109 West 57th Street, Manhattan (14-7876) (Oct. 1, 2013) (Architect: SHoP Architects).